In all of her years in journalism, the Dawn Jogger could not imagine writing the “headline” that accompanies this post. 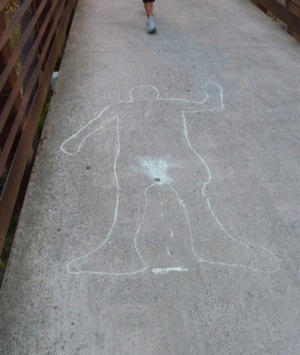 First, a confession: when she snapped this photo shortly after dawn this morning, she thought someone had just done a chalk outline of a person on the San Mateo Dr. bike bridge. She felt lucky that a person jogged by her as she thought the isolated foot gave the photograph interest.